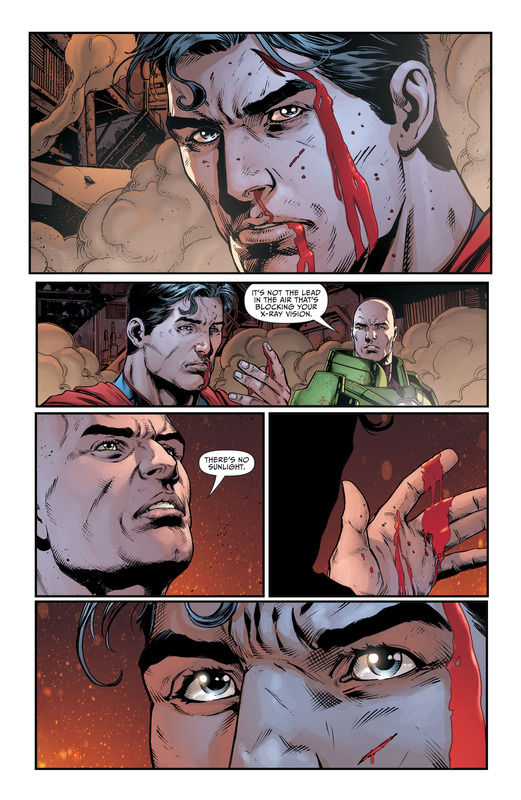 Clowns to the left of me, jokers to the right, Here I am, stuck in the middle with you in Justice League #43 written by Geoff Johns, art by Jason Fabok, Brad Anderson on color and Rob Leigh on lettering. an and Lex Luthor teaming up in the sun-less (uh oh you know what that means) Apokolipisan slums and the Justice League themselves caught between Grail and the Anti-Monitor versus Darkseid himself. I usually am quite detailed but I want to pull back and let people experience this narrative for themselves, it’s rather well done and dramatic. Essentially what you need to know is that Batman is now in a way, Metron, with Metron now off the chair and Bruce serving as the conduit for the Mobius chair. The Justice League, with the arrival of Mister Miracle goes into action to face Grail again while Bruce ascends to do his part. Mister Miracle chains Metron to a pillar, who after all is gone laments he is almost free (an interesting plot twist). 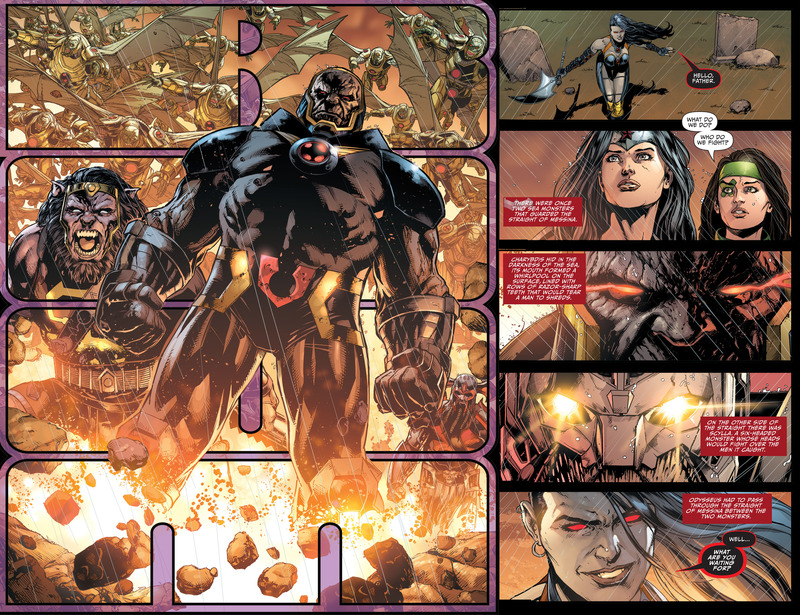 The team arrives just in time as Grail and the Anti-Monitor summon Darkseid to them to do battle. Meanwhile Lex and Supes are knee-deep in Parademons and Apokolipsian underlings trying to kill them, until Lex dumps the powerless Clark into a Apokolipsian furnace fire. Can you guess what happens next? Meanwhile the hunt for Myrina Black is still on: where did she go? How will the Justice League survive all of this?! 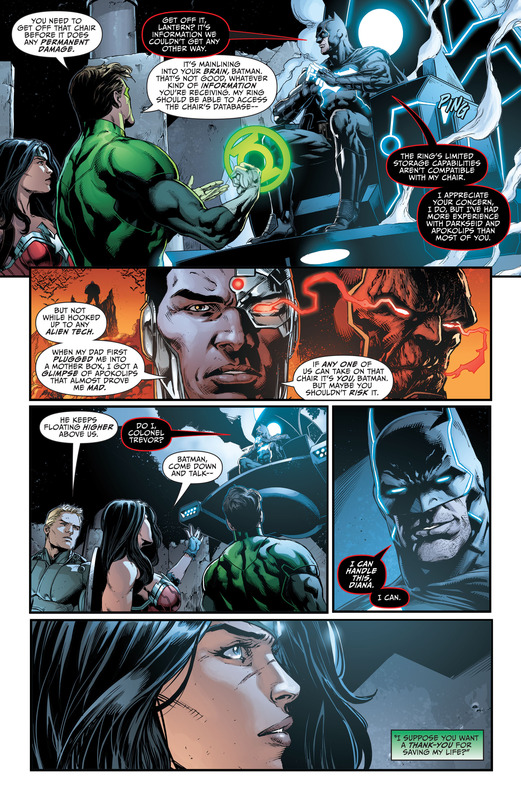 Diana is given POV again, which is great, and her trust in Bruce while in the chair is a nice moment. This is pretty strong stuff. It’s quite over dramatic and a bit…much in general but if you like cheesy impossible villiany and literal Bat-God (again), this is for you. Fabok draws rather well, I always think his work has a nice weight to it and he draws one of the stronger looking and regal Diana we have. Unfortunately aside from Diana a lot of his other women look similar, like Myrina and Grail. They are more weighted than how most comic artists draw women but he does need to spice his designs up a little. I’m learning to accept Johns repeated motifs and tropes (Batman getting a power-up?!) as writer and while not all the ideas are 100% good, or rather could have implemented a bit differently, it’s really not terrible work either. The comic is pretty well done as an entity. It’s over the top, but you can’t put it down as not dynamic work. And while the coloring follows DC’s current house palette of choice and could use a slight more touch of stylized coloring, it is nonetheless rich with cinematic flair that matches Fabok’s weighty work and paneling. I don’t know what is going to happen next; that is a good sign.